Alejandro (Sanchez) ekes out a living day-labouring, scraping together money to bring his wife and young son to America. His brother Memo (Aguirre) arrives on his doorstep having hopped the border. Together with the timid Tonio (Tavira) and the hot-headed Hector (Roberto Sanchez) they persuade passing motorist Liz (Collins) they can complete a conservatory she is building. Taking the Blumhouse model of restricting the action primarily to a single location, Pachman and co-writer Mavrothalasitis’ use their lean 83-minute run time for an impressive display of economic storytelling. That Liz’s estate is surrounded by electrified fence and Memo discovers grim clues on power tools also ratchets tension. When the horror finally erupts (in disconcertingly bright sunshine) it is almost a relief. Home invasion movie connoisseurs will be familiar with the plot brushstrokes, but Beneath Us subverts and surprises right up to the climactic moments. The white elite terrorising have-nots is no longer new news; The Purge built a franchise on it. 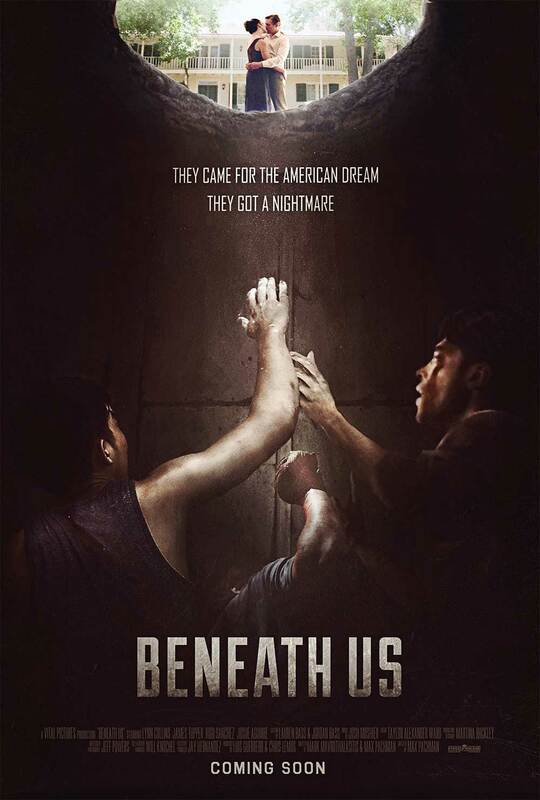 Yet, Beneath Us makes barbed swipes at surface-level tolerance and cruel privilege that places it in the same company as Jordan Peele’s Get Out or Wes Craven’s The People Under the Stairs. Despite the open spaces, Pachman cleverly keeps his film claustrophobic and unwelcoming by placing his Mexican characters into tight spaces. The trunk of a car, a cramped apartment, the partially built-conservatory, holes in the ground. Sanchez and Aguirre bring a genuine fraternal bond as the brothers who have stumbled into a nightmare. Collins plays it big as the well-heeled (and lethally heeled) psycho humiliating the help before unleashing hell, remaining on the right side of pantomime in a memorable turn.